Competitive Intelligence Analysis: I’ve Done the Research – Now, What Do I Do With It? Currently part of Pfizer, Kristy Morley began her career in pharmaceuticals when she joined Wyeth (formerly American Home Products Corporation) in 1997, in the Nutrition Division. She initially began as a Project Manager in the New Product & Process Development Group. Kristy made the move to competitive intelligence in 2001, serving the the Nutrition Research group with competitor R&D pipeline tracking. The function grew and was moved to the Marketing group in 2006. The CI group currently provides intelligence consulting, expertise, and oversight to brand teams, new product groups, and Senior Management. Prior to joining Wyeth, Kristy spent five years at Avebe America, Inc and holds a B.S. in Food Science and Technology. She has been a member of SCIP since 2001 and is a graduate from the Gilad-Herring Academy of Competitive Intelligence, and currently serves as a member of the SCIP Philadelphia Chapter Steering Committee. Categories: Competitive Intelligence, Packaging Research, Research | Tags: analysis, Competitive Intelligence, Research | Permalink. Beginning a new Competitive Intelligence effort at your firm can be a challenging task. Register for Establishing a Competitive Intelligence Function at Your Law Firm: A Beginner’s Guide to the 4 D’s on February 4, 2010, and the webinar presenters will guide you through the step-by-step process of establishing a CI effort at your firm. Key assessment activities, needs assessments, information audits and cultural assessments, will be introduced that will enable you to set the foundation of your CI effort. The day-to-day activities of CI group processes and procedures will be covered as well as tracking your group’s CI effort to make CI measurable to the executive committee. Carrie P. Long, MLIS – Research Analyst, Nina Platt Consulting, Inc.
Research analyst, Carrie Long, has a Masters of Library and Information Science and over 10 years of experience in law firms and libraries, with her most recent position in an AmLaw 100 firm as Manager of Research Services. Carrie has extensive experience in managing and executing large, complex Competitive Intelligence (CI) and Research projects in the areas of: law firm and practice area analysis; company and industry analysis; product analysis, market share analysis and prospecting. Carrie’s current clients include: information services vendors; legal vendors; and law firms. Barbara Williams has over ten years of progressive and cross industry experience and responsibility in Competitive Intelligence and business development in the online information, legal and facilities management industries. Prior to her current position as Market Analyst at facilities management provider, USM, Barb was a Competitive Intelligence Analyst at Fox Rothschild. She was responsible for providing in-depth business, industry, and competitive intelligence analysis support to attorneys and practice groups for the 450-attorney firm. At Thomson West, now Thomson Reuters, Barb was the Manager of Competitive Intelligence. During her tenure with the company, she co-developed the CI function, which provided CI support to market research, marketing, field sales, and new product development initiatives. Barb has additional expertise and experience in product analysis and sales force intelligence. Categories: Competitive Intelligence, Training | Tags: CI, Competitive Intelligence | Permalink. During the end of April and early May of this year, at the request of ILTA Knowledge Management Vice President, Catherine Monte, NPCI asked the directors of the NLJ 250 to respond to a survey regarding how their firms were approaching CI. With 77 firms responding, we received the following results. We will be posting additional information from the survey at a future date. In the meantime, we would love to get your feedback on this information including resources you use that are not on the list above. Categories: Competitive Intelligence, Role of Librarian | Tags: Competitive Intelligence | Permalink. I ran across a interesting web service recently named RivalMap. It is a service that provides the following functionality (according to their website). RivalMap is web-based collaboration software that gives companies a central place to share and address information about competitors and their industry. If your company spends any time watching competitors and their activities, RivalMap will make the management and communication of competitive information much easier and more effective. After signing up for the free service that allows 3 users access with the ability to create unlimited workspaces, I set up a workspace for my own company. The cost of the service jumps to $49 for 5 users, $99 for 10 users and $199 for 25 users. Besides giving access to more users, the fee-based service provides storage for file sharing and SSL Security. Enterprise licensing is available as well. Competitors: This tab allows you to create entries for your company and for any competitors you specify. A sub-menu provides tabs for Competitors, Products, and Concerns. Competitors – Create a posting for each competitor that includes name, website address, profile, concerns, clippings, notes, customers, and a SWOT analysis. Concerns are comments about specific threats the competitor may present. Clippings are articles or web posts worth noting. Notes are just that – free form notes about the competitor. Customers provides detailed records on the competitor’s customers including customer name, location, market segment, sales amount, date of sale, description of sale and website. SWOT provides the ability to list strengths, weaknesses, opportunities, and threats faced by the competitor. Products – Create postings for competing products including profile, product name, competitor name, product website, concerns, clippings, and notes. Clippings: Described above under Competitors. Notes: Described above under Competitors. Customers: Slightly different from the use of customers above, here you post information about your own customers. After setting up market segments, you are able to create a post about each segment including notes, clippings, needs, and customers. Attractive – a benefit/function that is not expected but highly satisfies the customer. Customers – create a posting about each customer including the same information listed above. 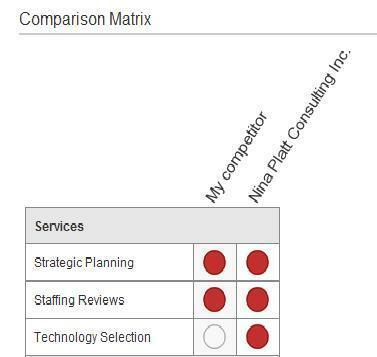 Comparisons: This tab allows you to create a matrix that compares competitors by category and attributes. For example, I could create a category of the services I offer and the attributes each service has. I could then add competitors. 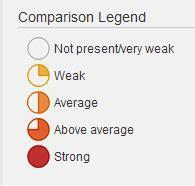 Following that, I would rate how my company compares to my competitors by category/attribute. The following screen-shots demonstrate how the matrix would look. In addition to providing great information, each tab provides the ability to filter results in multiple ways. This looks like a very useful service is that would be a valuable addition to any CI program. One concern is that, like any knowledge management system of its kind, it takes team members willing to take the time to enter content. The success in using the service will only come with commitment. As for functionality, a reporting function seems to be missing. This may be because I was using the free service. You would definitely want to check that out before subscribing to the service. Categories: Competitive Intelligence, Knowledge Management | Tags: Competitive Intelligence, Knowledge Management | Permalink.